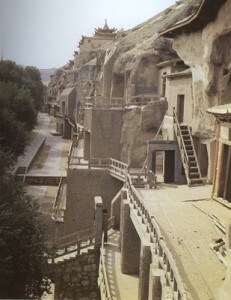 The Dunhuang Caves:The caves, located near the oasis of Dunhuang, on the southern route of the Silk Road are more than three thousand kilometers from Beijing. Nearly five hundred caves, carved into a cliff of relatively soft stone, allows a fabulous journey through a thousand years of religious history and art from the fifth to the fifteenth century. The cave paintings are a unique collection of places and stories about the Buddha and mythological figures … The painted statues found in many caves are initially modeled in clay on a wooden frame and some are very large The most famous date from the Tang Dynasty (618-907). Two institutions, the China Cultural Centre in Paris and the Guimet Museum of Asian Arts, have jointly organized an exhibition (ending march 2009). The visitor can go first to the Chinese Cultural Center where two caves were reconstructed, five meters high, including the murals and statues, and and also visit an exhibit of beautiful reproductions of murals where one can see the evolution of styles and themes. A presentation of photos in the new building can be supplemented by lectures and films. On the other side of the Seine,in the Musee Guimet, we discover an exhibition with a special lay out within the museum collections, and this innovative solution is made possible by the importance of Dunhuang documents in the permanent collections of the museum. These works are reported and commented by the texts of the exhibition’s curator, Jacques Gies. This choice, besides the practical and economic advantages, help to integrate the different styles found in Dunhuang in the Chinese Buddhist sculpture. A collection of votive paintings complements the exhibition with superb works on paper and silk from the eighth to the tenth century, describing some subjects of lamaic buddhism (because of the long occupation by the Tibetans during the ninth century ). In the early 1900, the keeper, puzzled by a plastered and painted wall, discovers a “walled library” containing, in about two hundred square meters, a mass of manuscripts up to three meters high; 50 000 documents, Buddhist paintings and objects mainly preserved by the dry climate and locked up for nearly a thousand years. The Chinese authorities in the province, informed of this discovery, do not measure the importance. But in 1907, Britain’s Sir Marc Aurel Stein was able to buy thousands of manuscripts which are the pride of different museums in England. In 1908, China expert Paul Pelliot (1878-1945) spent fifteen days in the cave and was able, through his scholarship and his language skills, to purchase the most interesting documents. A massive collection which was investigated during several decades and which, for this area, is the core of the collections of the National Library and the Musee Guimet. Pictures taken by Charles Nouette for the Pelliot mission, are also exhibited at the Musée Guimet, and allows to imagin what was this extraordinary adventure. The Dunhuang documents have largely led to renewed studies of the links between China and Central Asia and the history of the introduction and development of Buddhism in China. It should be noted that international cooperation was established around the “International Dunhuang Project” to digitize all the documents from Dunhuang and put them online for free on the Internet to facilitate teaching and research; 170,000 documents are in the Internet database to which the French museums will now cooperate.